During a protest held in March 2013, 7 monks were arrested and imprisoned for cheering for Tibetan Freedom. Topjor, one of the monks, was accused of being the leader of the protest and sentenced to 5 years of prison, during which he had to face food deprivation, torture and continuous interrogations. The worst part of the sentence, according to Mr. Topjor, was «patriotic education», a form of torture that and is only applied to Tibetan prisoners of conscience. Despite all he underwent, Mr. Topjor, who now lives in exile, still strongly hopes for the liberation of Tibet. Tibetan freedom imprisoned: Interview recap with Topjor, former political prisoner. Dharamshala –"My wish has not changed, it was and still is for a free Tibet." These words come easily today from Topjor, who now is living safely in exile. But in Tibet in the early 1990's, his words carried much greater consequence. On 12 March 1993, Topjor and six other monks left their monastery in Maldokungar and traveled to Lhasa, where they took part in a protest calling for Tibetan freedom. 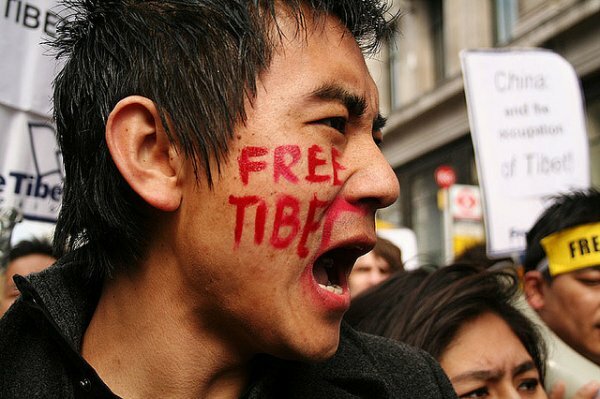 They cheered "Free Tibet," and "Long live His Holiness." All six of them were swiftly arrested by Chinese police and brought to Sangje jail where Topjor began the long experience that would be his incarceration. After being held for over a month, Topjor and the other monks were finally sentenced. Topjor, presumed by the Chinese to be the leader of the protest, was sentenced the longest of them all. For the next five years, Topjor was jostled between two different prisons where he was subjected to constant torture and interrogation. But he claims worse than that was the hunger. In one jail, Topjor received just one tiny tinmo with very little soup as his meal three times daily. In a second jail, Topjor shared one tray of tinmo with the other 11 prisoners in his room. Topjor claims that the worst form of torture came during his stay at Drapchi jail, also known as Lhasa Prison No. 1. Drapchi is the largest prison in Tibet and most notorious for violence. Before 1959, Drapchi was a military garrison, but it was transformed into a prison after Tibet's so-called 'liberation.' There are several reports about the practices of Drapchi jail in 2001. One report said that 27 deaths occurred inside its walls between 1987 and 2001. Topjor's experience indicates that these reports are wholly accurate. He describes a tortuous process that he and the other political prisoners underwent, known as patriotic education. Patriotic education was a Chinese policy officially launched in 1996, though it is alleged that unofficial practices began well before then. Today it is known as the 'Love Your Country, Love Your Religion' Campaign. Perhaps first practiced in monasteries and nunneries and soon after spreading to the lay community and prisons, it operates with a five-point plan, forcing Tibetans to 1) oppose separatism; 2) embrace the unity of China and Tibet; 3) recognize the Chinese-appointed Panchen Lama; 4) Renounce His Holiness the Dalai Lama; and 5) deny that Tibet has any claim to independence. Topjor underwent this cruel form of mental torture and continues to feel the effects today. He stated, "The biggest problem we faced in prison was patriotic education. It was during this process that we were most severely beaten, and many people died." The Chinese government claims patriotic education to be a success, however the continuing flow of Tibetans into exile, the continued practice of self-immolation in Tibet and the number of deaths that have occurred at Drapchi Prison alone tell an alarmingly different story.